As hinted last month, Google has reached a deal with The United States Government and has agreed to pay a $22.5 million fine for overriding iOS Safari users’ privacy settings in order to better track their web browsing activity. Google Inc. agreed to pay a record $22.5 million to settle allegations by the U.S. Federal Trade Commission that (FCC) it breached Apple Inc. Safari Internet browser. The fine, the largest ever the FTC has levied against a company, represents the first by the agency for a violation of Internet privacy as the agency steps up enforcement of consumers’ online rights. After paying the fine, this matter will be put to rest. As you’ll recall, Google’s shady practices were exposed back in February when it was discovered that Google planted a sneaky code that tracked users’ web browsing history even if they had specifically disabled tracking cookies. 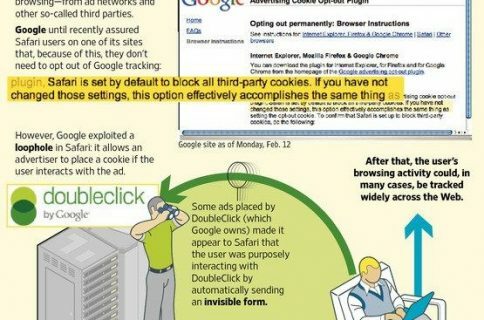 Google said it was tracking folks only to serve relevant ads, but the search company actually went to great lengths to exploit a hole in the Safari browser in order to achieve non-stop tracking. I guess Google had what was coming to it, no?